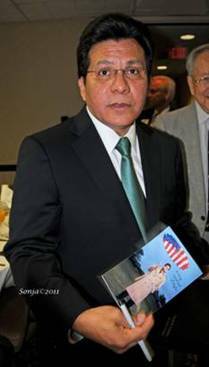 US Attorney General Alberto Gonzales On Immigration, And Obama And His Immigration 'Party'! He holds in his hands a photograph taken for Esquire magazine by Brent Humphreys. He related to me that this photograph was taken on a cold, bitter wet day and that over 1000 frames were taken to come up with the final photograph for the magazine. He also mentioned that he was not necessarily happy that his umbrella had become the US flag. I enjoyed his account of the day with the photographer. I usually do not totally agree on any subject with any politician. But listening to Gonzales’ ideas on comprehensive immigration reform, I firmly believe that we must act on this crisis that we are experiencing. Gonzales did give President GW Bush credit for trying to bring about change but acknowledged that he was unsuccessful. His comment that “the political party responsible for delivering comprehensive immigration reform and getting it done in a civil tone will win the hearts and minds of the Hispanic American voters and will likely control politics in 2012 and beyond.” I agree with him. We are in a battle for our lives and we must understand how important it is to unite all Americans to defeat this Obama administration. He went on to say that the Hispanic population has exploded and some day soon these young Hispanic Americans will be our future voters, future workforce and future state and country leaders. He urged all of us to tone down the rhetoric concerning the Mexican undocumented worker as he believes that most come only to work and in all probability want to return home to his family without becoming an American citizen. As Americans and Texans we have experienced that there are some jobs Americans do not want to do and that there are some skilled jobs Americans are not available to do. For this reason a pathway to citizenship should be part of the comprehensive immigration policy. Paying a penalty by those undocumented workers who are working and do not have a criminal record. These undocumented workers should not be given preference over the immigrant willing to abide by our immigration laws in pursuing US citizenship. He also thinks that tougher penalties for employers who hire undocumented workers should be part of immigration reform. As Americans we have to face reality that America is changing. Gonzales noted that we must then understand that in our changing world we must ask our federal government to pass immigration laws that will support our economic interests. Gonzales went on to say, “All Americans irrespective of our skin color should fear uncontrolled changes to immigration in this country.” Our government leaders must step up to the plate and do what they are supposed to do. Easy to say, how easy is it to enforce? We all know that it will NOT happen with Obama at the helm. In fact, he will use every opportunity to work with the devil himself to win the 2012 election. Tuesday, April 19, Obama met with Arnold Schwarzenegger the actor Republican from the failing state of California, Michael Bloomberg from New York who supports the Muslims over the 911 supporters, and San Antonio’s Mayor Julian Castro whose mother believes we stole Texas from Mexico and hates the Alamo. What do you suppose they are planning? Could it be a civil comprehensive immigration plan for the starving undocumented Mexican worker? Or could it be a pathway to his 2012 Victory? Unfortunately, the news of this meeting is obscure in the media and we may never know exactly what was said. Below is the list of the Socialists/Democrats from the WH as to the attendees to the immigration reform ‘party’. There may be a handful who are not Socialists/Democrats but certainly are in the minority. Note that no members of congress were invited. We will know how Obama is ‘helping’ the poor undocumented Mexican worker from the evil greedy Americans who do not want to share soon enough. Where in Mr. Gonzalez's speech did he address the question of why the Obama administration, which says jobs are a "top priority," is permitting 8 million illegal aliens to keep their jobs, and each month continuing to issue 125,000 work permits to foreign workers while 22 million American citizens are unable to find full-time work?